Indigo Roth: * And Would I Mind Awfully? 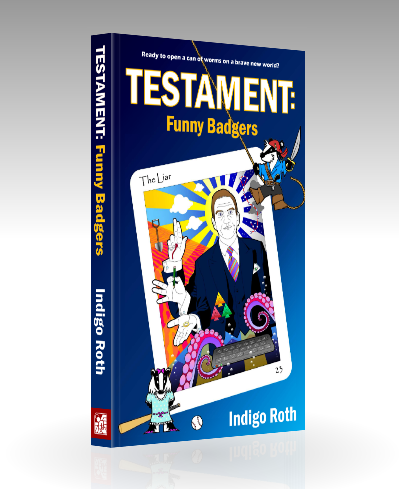 Today’s tale includes badgers, Max and time travel. For Nicky. Nicky and Mike over at We Work For Cheese are running a writing challenge throughout February. I’m fond of Nicky, but her heart and other interesting parts belong to Ziva. And dammit, they refuse to invite me over. When pizza is delivered, my heart always races. Hari Om Roth - and can't help thinking you've been "had" on all accounts here! Hari Om is the greeting of universality "the God in you is the God in me", so you're on the right vibration! And it has just dawned on me that I have incorrectly addressed you with surname, for which I apologise. Blame fifies female "menopolyximenia"... amends is that you're in the top5 blog roll at My Take!... or would you rather have my veggie pizza recipe? Did someone say pizza for breakfast? I'll be right over. Well, maybe not right over. Excellent exchange with someone with a cardboard personality. And I must say a very generous act, considering you weren't going to be partaking yourself. Such agony, I feel your pain. No pizza for you? Couldn't you just time travel to the future where you're at your desired weight and have a piece then travel back? Oh, I like Jayne's idea! Linda, you're not helping! And DAMMIT now I'm hungry! You are getting me EVERY SINGLE TIME with that! I never expect it!!!! When I read Chili on the pizza... I am picturing chili... like someone ladling chili on a pizza... and thought, "wah?!" Now, in all honesty, I am craving pizza. "Inside me, there's a thin person trying to get out!" Looking marvelous is painful. Still, you are doing it! And your future lady friends will be worth the sacrifice. Wait and see! Pizza is by far my favorite food, so I'm right there with you, Indigo. By the way, do British people ever actually say "dude" without a sense of irony? How do you do it, man? I cannot bear to be around pizza and not eat it. I MUST have it! It's the same way with potato chips. I can't have them in the house because I devour them in one sitting. HMMMM.... perhaps that's something I should address when it's time for the "compulsively" prompt.